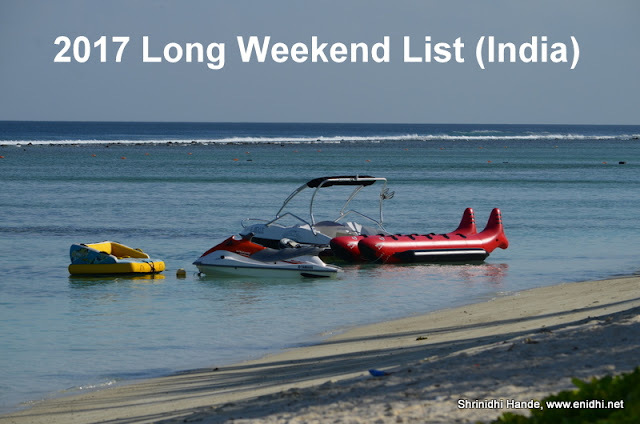 Home / Travel and Living / Long Weekend Calendar-2017-India- Start plannning your vacation! Long Weekend Calendar-2017-India- Start plannning your vacation! I was looking for 2017 long weekend calendar but didn’t find any. Then decided to make one myself. For the benefit of office goers who wish to plan their holidays, I am sharing the 2017 long weekend calendar for India below. Down load a copy and start planning your vacation. Information validated against information available in public domain and general knowledge. Official govt declaration may have deviations. Few festivals falling on Mid-week (Wednesday are not considered here- Deepavali and Kannada Rajyotsava day are 2 examples. You can make a 5 day or 9 day trip by taking 2 or 4 days off around these mid-week offs. :). Best wishes to them! Have fun n travel more! @nisha- you are lucky one! This is so helpful. Now to plan my vacations for next year with this. This year I got practically very few weekends due to studies.